Since starting an interfaith Cooperation Circle, Lori Whittemore has met a rich array of people from groups she had no idea were even a part of her community. "The minute we started doing this work, people came out of the woodwork. "I didn’t realize how much of a hunger there was to do interfaith community in alternative ways", she said of her community in and around Portland, Maine. 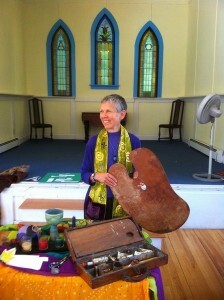 Whittemore brought the idea for Abbey of HOPE, which stands for Hands of Peace Extended, to her interfaith community in May 2014. In October 2014, they became the first United Religions Initiative Cooperation Circle in Maine, and in the beginning of 2015 they launched full-fledged programming. In February, the Abbey hosted a World Interfaith Harmony Week observance focusing on the Golden Rule. "There was a gentleman present who practices Scientology. I had no idea there were Scientology communities in Maine," said Whittemore. "My life was changed….I would have never in a million years heard someone with that story if we had not been doing outreach through our newsletter." Then, there was a Baha'i woman who reached out to Whittemore to share about her experience being persecuted in Iran. "In Maine, I have never found a platform to meet faithfully diverse folks," she said, “And even when I do, I would never have imagined meeting up with someone who practices Baha’i from Iran." "Just because you don’t speak about God in a specific language doesn’t mean that you don’t experience what is Holy," she said. Recognizing that spiritual and religious differences are often aligned with cultural differences, the Abbey also partners with University of Southern Maine's office of Multicultural Student Affairs to create space for diverse people to meet -- and to respond to religiously motivated violence and hate. Next week, they will do this through an event called Neighbors Standing Shoulder to Shoulder where people from various faith communities will gather to share stories and expressions celebrating the Golden Rule. In a true showing of the power of United Religion's Initiative global network, Whittemore was able to share about this event with interfaith leaders all around the world, when there was a call for action after the twin bombing of churches in Pakistan. "We need to stand together collaboratively as faithful people in the face of religious violence," Whittemore wrote to her fellow Cooperation Circle members across the globe. "I invite you to consider April 7 for this purpose." Whittemore and the Abbey's Leadership Circle are also passionate about extending the opportunity to share in these gatherings to people who cannot attend in-person. The Abbey provides accommodation for people to attend events digitally. At least a portion of participants at each event attend this way. Whittemore has seen this type of connection happen in a very meaningful way for a member of the Abbey's Leadership Circle who had difficulty getting around during the icy winter. When she told the board she was going to resign, Lori said "No, no, no let met set you up with Zoom. Now, through the Abbey's innovative uses of technology she is able to be a part of a diverse community of people learning to live together faithfully in an ever-changing world. How can you join the Abbey of HOPE? Sign up to receive regular, interfaith contemplative reflections by sending an email toreflectionary@abbeyofhope.com with the word “Subscribe” in the subject line. 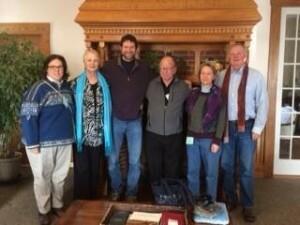 "We are an interfaith community located in Southern Maine and Northern New England gathering to promote, facilitate and encourage interfaith understanding through fellowship, educational opportunities, programming, retreats, pilgrimages, mission, conferences, interfaith gatherings, projects and service."